The Alexa LF large-format camera fitted with a 47mm DNA lens. ARRI Rental’s exclusive DNA lenses will soon become available specifically for the Alexa LF full-frame format. The new DNA LF lenses, which are being introduced at the 2018 Camerimage festival of cinematography in Poland, will initially be available in a series of nine focal lengths, ranging from 21 mm to 135 mm. Prototypes have already been put to use with Alexa LF cameras on the TV dramas Killing Eve (season two) and Catherine the Great, and on the movie Ironbark. Originally developed for the 65 mm format of ARRI Rental’s ALEXA 65 camera platform, DNA is a unique concept in lens creation. In essence, it is technology born of relationships: vintage optics rehoused and customized in partnership with filmmakers, to reflect their artistic sensibilities. The extensive detuning and personalization that was pioneered with the first generation of DNAs has informed the look of DNA LFs. It is a balanced and characterful look, full of life and gentler than many modern lenses. Focus fall-off is natural and pleasing, highlights are rendered in a mellow way, and the flare characteristics offer great scope for creativity, responding organically to direct light sources. New multi-blade irises have been built into every lens, providing consistent out-of-focus highlights and attractive bokeh. While Prime DNA lenses for the larger ALEXA 65 format can be used on the ALEXA LF, doing so eliminates some of the interesting, imperfect elements at the edges and corners of the image, which are so revered by filmmakers. 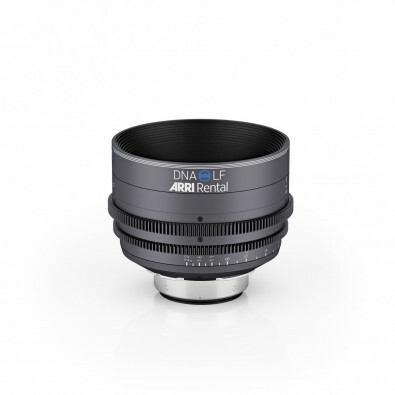 It therefore makes sense to offer DNA LF lenses purpose-made for the ALEXA LF, featuring a 49 mm image circle that is perfectly matched to the LF sensor. DNA LF lenses will be available as part of ALEXA LF camera packages from ARRI Rental facilities worldwide, starting around the end of Q1, 2019.